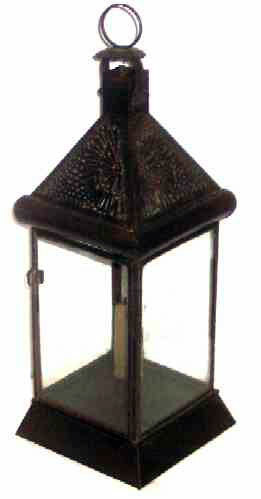 Presented here, a beautifully detailed Tin Candle Lantern with nicely detailed reverse punching on the top. 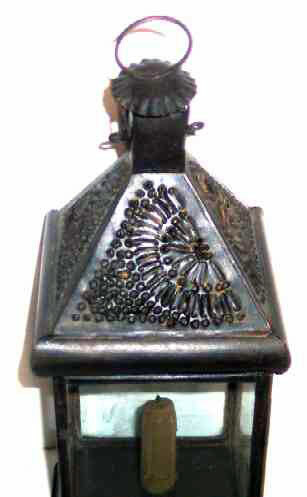 A punched "FAN" motif is reversed on two of the four sides such that the bottoms of both pair of fans abut each other creating a 360 degree pattern when viewing the lamp from the corner rather than face on. This very attractive use of the design creating a delicate lacework effect in tin and a wonderful radiance when the candle is lit. As compared to most tinsmith work, virtually no soldering is visible. Great care was taken in designing, cutting and fitting the pieces. The overall result is a fine lamp made with great skill and little concern for time expended. A "Ten"! Size is 14" high including the hanger and the base is 5-1/4" square.